ზეახალი ვარსკვლავი (ლათ. supernova [ˌsuːpərnoʊvə] (მხ. რ. ), supernovae [ˌsuːpərnoʊviː] (მრ. რ. ), ტერმინი გამოიგონეს ასტრონომებმა — ვალტერ ბაადემ და ფრიც ზვიკიმ 1931 წელს) — ვარსკვლავი, რომლის ბრწყინვალება რამდენიმე წამში იზრდება, დაახლოებით, 20 ვარსკვლავიერი სიდიდით, შემდეგ კი შედარებით ნელა მცირდება და პირვანდელ ნათებასთან საერთო აღარაფერი აქვს. ზეახალი ვარსკვლავის ანთება ბევრად დიდი მასშტაბის მოვლენაა, ვიდრე ახალი ვარსკვლავისა. ანთების მაქსიმუმის დროს ზეახალი ვარსკვლავის ბრწყინვალება, თითქმის, უტოლდება იმ გალაქტიკის ბრწყინვალებას, რომელსაც ეკუთვნის. ამ დროს სპექტრში ჩანს ძალიან განიერი ხაზები. ეს მიუთითებს იმაზე, რომ ვარსკვლავიდან ნივთიერება გამოიტყორცნება 20000 კმ/წმ-მდე სიჩქარით. ზეახალი ვარსკვლავის ანთება იშვიათი მოვლენაა; ცალკეულ გალაქტიკაში, საშუალოდ, საუკუნეში ერთხელ ხდება. მას მერე, რაც XVII საუკუნის დასაწყისი ტელესკოპი გამოიგონეს, ჩვენს გალაქტიკაში ზეახალი ვარსკვლავის ანთება არ შეუნიშნავთ. იმ ადგილებში, სადაც, მატიანეების მიხედვით, ზეახალი ვარსკვლავი აინთო, ამჟამად შეიმჩნევა თავისებური მნათი ნისლეულები, რომლებიც ზეახალი ვარსკვლავის ანთების შედეგადაა წარმოქმნილი. მათგან ყველაზე კარგად შესწავლილია კიბორჩხალისებრი ნისლეული, რომელიც 1054 წელს ანთებული ზეახალი ვარსკვლავის ადგილზე მოჩანს. ამ ზეახალი ვარსკვლავის ნაშთია გამოკვეთილი პულსარი კიბორჩხალისებრ ნისლეულში. ნისლეულის ცენტრალური ნაწილი და პულსარი სპექტრის ვრცელ დიაპაზონში (რადიოდიაპაზონი, რენტგენული დიაპაზონი და სხვა) ასხივებენ. გაფართოების სიჩქარე ამჟამად, დაახლოებით, 1500 კმ/წმ-ია. როგორც ცნობილია, ვარსკვლავში თერმო ბირთვული რეაქცია მიმდინარეობს. რეაქციის მიმდინარეობასთან ერთად, მასში მონაწილე ნივთიერების რაოდენობა იკლებს და წამოიქმნება წითელი გიგანტი. ამ დროს რეაქციის შედეგად წარმოქმნილი წნევა მცირდება და დგება მომენტი, როცა წითელი გიგანტის შიგნით არსებულ წნევას მისივე მიზიდულობის ძალა გადააჭარბებს ანუ არსებული წონასწორობა ირღვევა. ზედა ფენებში არსებული მატერია „ჩაიქცევა“ და დიდი აჩქარებით დაეცემა ცენტრში არსებულ მატერიას. ხდება აფეთქება, რის შედეგადაც ვარსკვლავის მატერია დიდი სიჩქარით გაიტყორცნება სივრცეში. ამ მომენტს ზეახალი ვარსკვლავის ანთება (აფეთქება) ჰქვია. დაკვირვებად სამყაროში ეს ერთ-ერთი ყველაზე გრანდიოზული მოვლენაა. აფეთქების ენერგია გამოსხივდება ყველა დიაპაზონში და მთლიანად პროცესი უაღესად მასშტაბურია. გამოსხივების სიმძალვრე ზოგჯერ მთელი გალაქტიკის გამოსხივებასაც კი აღემატება. აფეთქების შედეგად ვარსკვლავს ჩამოსცილდება ზედა ფენები, რჩება მხოლოდ ბირთვი, კომპაქტური ობიექტი, რომლის თვისებებს მხოლოდ მისი მასა და, შესაბამისად, გრავიტაციული ველის ძალა განსაზღვრავს. მასში არსებული მატერია თავისივე გრავიტაციის გამო იკუმშება და მისი სიმკვრივე წარმოუდგენელ სიდიდეს აღწევს. ბეტე, ჰანს (September 1990). "SUPERNOVAE. By what mechanism do massive stars explode?". Physics Today 43 (9): 24–27. Bibcode 1990PhT....43i..24B. . http://web.archive.org/web/20110611231333/http://www.physicstoday.org/vol-43/iss-9/vol43no9p24_27.pdf. კროსველი, კენ (1996). The Alchemy of the Heavens: Searching for Meaning in the Milky Way. Anchor Books. ISBN 0385472145. A popular-science account. Filippenko, A. V. (1997). "Optical Spectra of Supernovae". Annual Review of Astronomy and Astrophysics 35 (1): 309–355. Bibcode 1997ARA&A..35..309F. . An article describing spectral classes of supernovae. Takahashi, K.; Sato, K.; Burrows, A.; Thompson, T. A. (2003). "Supernova Neutrinos, Neutrino Oscillations, and the Mass of the Progenitor Star". Physical Review D 68 (11): 77–81. arXiv:hep-ph/0306056. Bibcode 2003PhRvD..68k3009T. . A good review of supernova events. List of Supernovae-related Web pages. RSS news feed (RSS). The Astronomer's Telegram. წაკითხვის თარიღი: 2006-11-28. Tsvetkov, D. Yu. ; Pavlyuk, N. N.; Bartunov, O. S.; Pskovskii, Yu. P.. Sternberg Astronomical Institute Supernova Catalogue. Sternberg Astronomical Institute, Moscow University. წაკითხვის თარიღი: 2006-11-28. A searchable catalog. * Tsvetkov, D. Yu. ; Pavlyuk, N. N.; Bartunov, O. S.; Pskovskii, Yu. P.. Sternberg Astronomical Institute Supernova Catalogue. Sternberg Astronomical Institute, Moscow University. წაკითხვის თარიღი: 2006-11-28. A searchable catalog. Anonymous. (2011-09-04) The Boom Next Door. Kabummer.com. წაკითხვის თარიღი: 2011-09-04. A short note on SN 2011fe Supernova, the closest supernova after 30 years. Anonymous. (2007-01-18) BoomCode. WikiUniversity. წაკითხვის თარიღი: 2007-03-17. 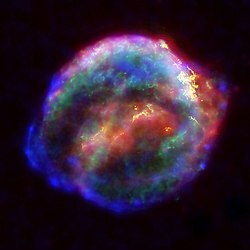 Professional-grade type II supernova simulator on Wikiversity. List of Supernovae with IAU Designations. International Astronomical Union. წაკითხვის თარიღი: 2010-10-25. Overbye, D.. “Scientists See Supernova in Action“, The New York Times, 2008-05-21. წაკითხვის თარიღი: 2008-05-21.
ეს გვერდი ბოლოს დარედაქტირდა: 00:46, 15 აპრილი 2017.